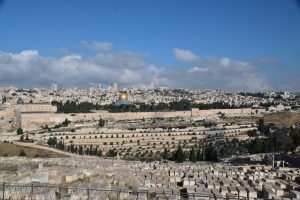 This is a trip summary of Day 4 of our March 2019 Israel-Jordan Tour. Today we traveled to the Golan Heights. The weather was ideal once again, with full sun and highs in the 70s. The sunrise was spectacular as well. After breakfast, we drove around the north end of the Sea of Galilee until we arrived on the east side (the other side, Mark 4). Towards the southeast corner of the lake is an off-the-beaten-track site called Hippos/Sussita. In the days of Jesus, this was one of the Decapolis cities (Mt. 4:24-25; Mark 5:20, 7:31). This site is full of ancient Roman ruins, including a number of Late Roman (Byzantine) churches. By the odion (small theater) we enjoyed a panoramic view of the Sea of Galilee. We read from Mathew 15 (Feeding of the 4,000), Mark 5 (the demoniac) and John 6 (Feeding of the 5,000). It was a wonderful introduction into the life and ministry of Jesus! The wild flowers (yellow, purples, reds) added so much unbelievable color! It was beautiful! Ascending to the plateau of the Golan Heights, we arrived at Katzrin/Qatzrin. This was a Jewish Talmudic village (3rd -7th century AD). Here we sat in a reconstructed stone house where we read from Mark 2 (a story that took place in Capernaum actually). But here we could imagine it happening in a house like this. We celebrated Jesus’ compassion and His authority (s’mekah) to heal and forgive! We also walked through the ancient synagogue here. Driving north, our next stop was the Syrian border. Both Shlomo and Ori shared a little about the modern situation with Syria. The 1967 and 1973 wars were fought here. Looking across the border we could see Kuneitra as well as other smaller towns. Also, Mt. Hermon stood majestically to the north, covered still with the winter snows. Syria has the highest peak of this mountain (9,200 feet), while Israel has the second highest peak (7,300 feet). Part of the mountain is also in Lebanon. Psalm 42, 89, and 133 all reference Mt. Hermon. Descending down off the Golan Heights our next stop was to Caesarea Philippi. Here, Rev. Scott shared from Matthew 16 and about the most important question Jesus shared with His followers, “Who do you say I am?” It was in the region of this very pagan city that Peter responded, “You are the Christ, the Son of the Living God!” Walking up to the grotto (sacred place), we saw where the temples of Augustus and Zeus were located, as well the niches for Pan, the Roman god of shepherding. The pagan god Nemisis was also honored here. There was also a lot of water flowing here from the Banias spring and from recent snow-melt! Our last stop of the day was to the nature preserve and archaeological site of Tel Dan. We first walked along the primary tributary of the Jordan here. Before reaching the archaeological site, we stopped to listen to Shlomo play his recorder. We also read (and sang) Psalm 42. While sitting on the steps of the high place, we read from Judges 18 and 1 Kings 12 about the patterns of disobedience that was put on display here. Both the Danites and later Jeroboam practiced false worship here. We were invited to be a living sacrifice unto God (Romans 12). Before leaving the site, we sat and looked across the border with Lebanon while Shlomo and Ori shared about the present situation with these neighbors to the north. We also saw Abraham’s Gate (a Middle Canaanite mud-brick gate) and the Israelite wall and double gate complex. Among these ruins they found the famous Dan Inscription (found in 1993) that mentions in Aramaic the “house of David.” It dates to the 9th century BC. The drive back to the hotel (past Hazor, Joshua 11) took about 50 minutes. Upon returning, we enjoyed dinner and a free evening.